Determination of the Effect of Environmental Factors on the Rate of Transpiration of a Leaf Shoot by Means of a Potometer. To demonstrate that different environmental factors has different effects on the rate of transpiration. Transpiration is the loss of water in the form of water vapors from the surface of the plant. Stomatal Transpiration: When the water vapors are lost through stomata. Lenticular Transpiration: When the water vapors are lost through lenticels (Openings in the corky tissue covering stem and twigs small). Cuticular Transpiration: When the water vapors are lost from the surface of the leaves, (other than stomata) and herbaceous stems. Potometer (Simple/Ganong). stand, twig with large healthy leaves, beaker, knife, wax, bell jar electric fan. Set up the apparatus as given in the diagram. Made the apparatus air tight with the help of wax. Select a healthy shoot and cut it under water by bending it in the trough. Submerge the potometer in the trough & fill it with water. With water hanging on the cut end of the shoot transfer it to the Potometer. Fix the potometer on stand and check that no water drops falls from the open end. This will ensure that apparatus is air tight. If water drop fall, check the corks and stop the leakage with wax. Repeat the process until complete water filled and air tight apparatus stage is attained. Leave the apparatus as such on the stand. This will not only show that apparatus is air tight but also allow an air bubble to enter in the open end of the potometer. When the bubble attains a length of lcm dip the open end in water contained in a beaker. Note the time for the movement of bubble through one major division on the graduated tube of potometer. Depending upon the speed of the bubble select a division equal to 0.1 ml or less as the requirement may be. 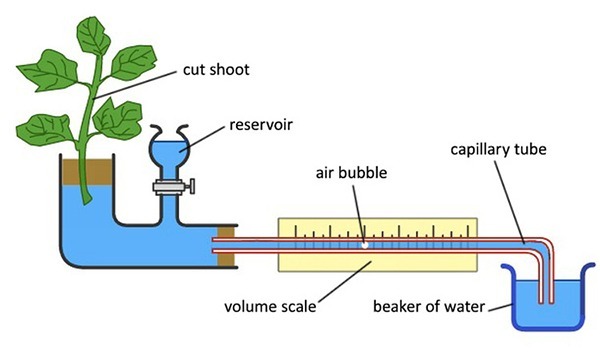 Calculate the rate of transpiration in the terms of ml of the water lost per minute. Trial No Time taken by the bubble to move through gradation equal to 0.1ml. Light Place the apparatus in bright sun light and in shade. Temperature Use different places of the same room with noted temperature. Humidity Spray water on the leaves and cover the plant with wet cloth. Wind Use fan to create wind effect. Cut the shoot underwater, the cut should be made at an angle of about 450. This will facilitate the fixing of shoot in cork/ rubber tubing. Apparatus should be air tight. To make the apparatus air tight avid the use of grease. Instead wax should be used. Before taking the reading for every change of environment give 5 minutes interval.